Applehead Siamese cats, as their name suggests, have rounded faces like apples! They also have bigger, heavier bodies than today's ultra-lean and svelte modern show cats. Appleheads came about after years of selective breeding during which Siamese breeders strove to produce a longer, thinner, more angular look in their show cats. This eventually resulted in some serious health problems both externally, with some kittens being born with ear and eye defects, and internally, causing cardiovascular and kidney complications. 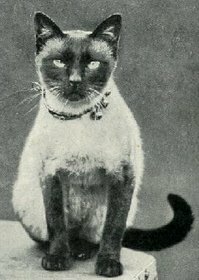 This caused an enormous amount of concern, and a move was started by some American breeders to try and return the breed to the look of the early cats that came from Siam (now Thailand) to the West, some time in the 1880s. These original Thai cats had smaller ears, less angular faces, bigger bones and rounder, more muscular bodies. The breed today (and the modern show winner) is small and very long, lean, and angular. In order to achieve the round 'applehead' look, breeders may have crossed their Siamese with other breeds. For example, the American or British Shorthair varieties, which have shorter, rounder faces. 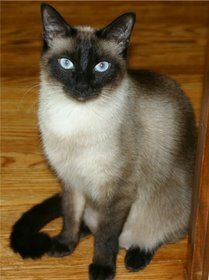 So it's possible that today's applehead Siamese cats are not, in fact, totally similar to those early Thai cats. Attempts to create a cat whose looks were more in keeping with those original Siamese may actually have gone too far, and many applehead faces may now be too round. This is because it's likely that the cats in those early pictures were un-neutered males. Stud cats tend to be heavier than neuters, and have a tendency to develop jowls that make them look round-faced, whereas in fact their faces (without the jowls) were probably more of a moderate wedge shape. But from the two pictures above, you can see that the look is very similar. The term 'applehead' is used mainly in the United States and was originally rather a derogatory one. British breeders don't generally use the term, preferring instead to use 'old style'. Applehead Siamese are extremely beautiful, with all the personality, intelligence and loving nature for which the breed is known.